Pump Up your Workouts with this KingTop MP3 Music Players! This lightweight device features a clip-on design that keeps your hand free. It is ideal for any kind of sports or activity, including walking, running or jogging. Stylish and fully functional this KingTop MP3 player makes the perfect workout and travel companion, just clip it on and go. 3.FM Radio: support radio band from 87.50MHZ---108.00MHZ (Allows preset station and FM recording). 4.Intelligent E-book Reader -- Able to display e-book in txt format. 6.Back Clip -- set your hands free during exercise and you don't have to waste money on an arm-band. 7.Battery: 300mAh -- Fully charged in 1 hour and lasts up to 30 hours music playing with earphone at moderate volume, about 8 hours in Bluetooth mode. 8GB MP3 Music Player with an expansion slot for memory card support up to 32GB enable to download thousands songs at a time.Auto play Up to 30 hours after fully charged, sun down sun rise yet it still playing. Take your ears to travel with real lossless sound ! 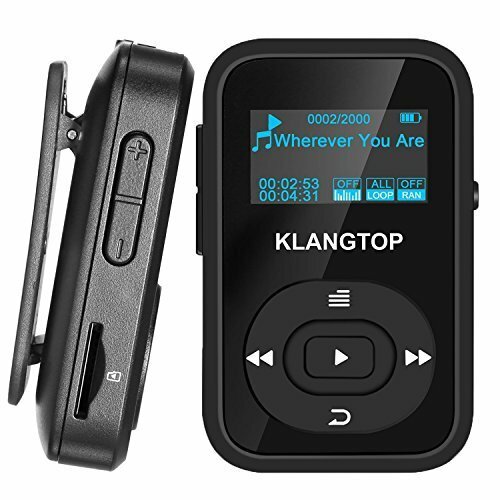 Durable High fidelity Headphones are included,enjoy your music wherever you go with this Kingtop Clip MP3 Player now,it comes with 100% Satisfaction Guaranteed for 90 Day Money Back Warranty and Lifetime Service !